We are on a little bit of an RV adventure for the next couple of weeks. I decided to ask some of my Facebook friends for suggestions on places to stop along the way. One of their suggestions for Okalhoma was POPS. 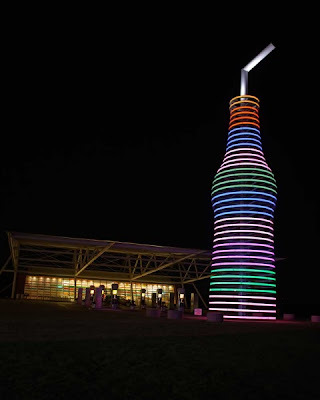 It is located on Route 66 and is a gas stations, resturaunt, shake shop, and soda ranch. It is the soda ranch that makes them so fun. They carry over 600 flavors of bottled soda. 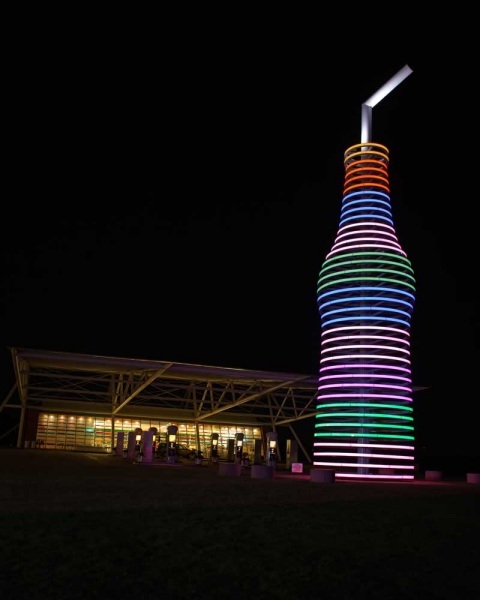 The other thing that makes them stand out is the 66 foot soda bottle outside, complete with a straw. If you are lucky enough to be there at night, it lights up with 'Time Square quality LED lighting'. So even if it is a bit out of your way, I suggest planning to stop for gas and a soda at POPS if you are ever in the area. You can check out more about POPS here. And if you are overwhelemed by the choices, go for their signature root beer (made in Arcadia, OK) or the Peach Nehi. Y-U-M! Sounds like such a fun family summer! Can't wait to hear about more of your adventures! We love POPS! Did you see the Round Barn just up the road? Another one of those famous Route 66 sights. I wish I'd have known you'd be in that neck of the woods. I'd have suggested The Rock Cafe in Stroud, OK (a few miles, but not far, from there.) The owner was the inspiration for Sally in the Pixar movie, Cars. Katie, we got to see Erin today! SO FUN! Lori,and OK Granny, I have been posting about the trip on Facebook, but I should have asked for suggestions here too! We did see the Memorial and I cried like a baby! And I did see the round barn. Had a round barn root beer too! That is such a fun place to visit! Awww fun! You're in my neck of the woods. Enjoy the Sooner State! We stopped here on our way to Disneyland last year. It was so much fun!!!! The picture taking opportunities alone are worth it. I am going back again this summer now that I have a new DSLR camera! Lol!! !